All of the pictures I am using come from the Metabunk site. One of the primary reasons that the man in the video cannot be Tamerlan is that the man in the video was arrested after Tamerlan was involved in the alleged shoot-out with police. The Andrew Kitzenberg pictures indicate the shootout wherein Tamerlan was killed occurred between 12:45 and 1:00 A.M. EST. At 3:07 A.M. EST, CNN announced the Naked Man had just been taken into custody. Interestingly, by this time frame, it is clear that the Naked Man was not arrested because the police thought he could be Tamerlan. He was likely arrested because there was some belief he was was Dzhokhar because the police already knew Tamerlan was dead. But I admit that is speculation on my part. But the pictures are not speculation and one really has to be a True Believer to look at these comparisons and still think that the man in question is Tamerlan. 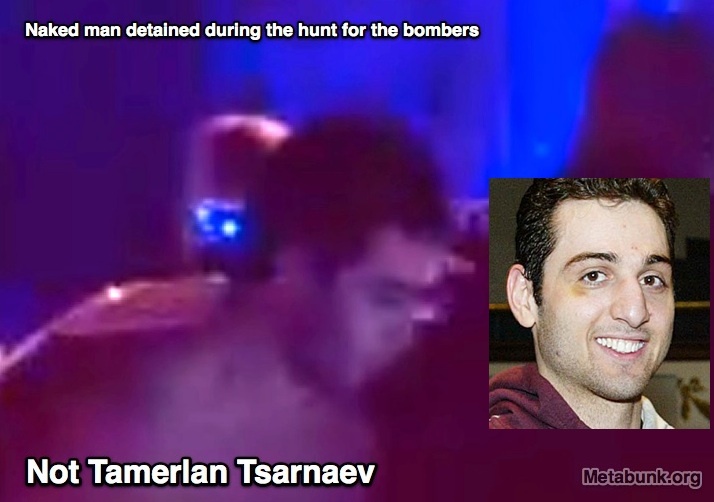 Here is an excellent comparison between the faces of Tamerlan and the unidentified naked man. Literally nothing matches up between the two faces, from the browline, to the nose shape, to the ear shape and placement to the depth of the eye orbit. It is clear the Naked Man is not Tamerlan. I use this phrase a lot, but it beggars belief that people are looking at images of these two completely different men and cannot see that they are not the same man. Here’s another comparison between the two men. Even in this very fuzzy picture, it is clear the brows of these two men are not remotely similar. The noses are also not even close to being alike. There are other elements to this debunk, like that the Naked Man has much lighter hair than Tamerlan and that he is much shorter than Tamerlan. I don’t even feel the need to discuss either because the face analysis on its own shows the Naked Man is not Tamerlan Tsarnaev. 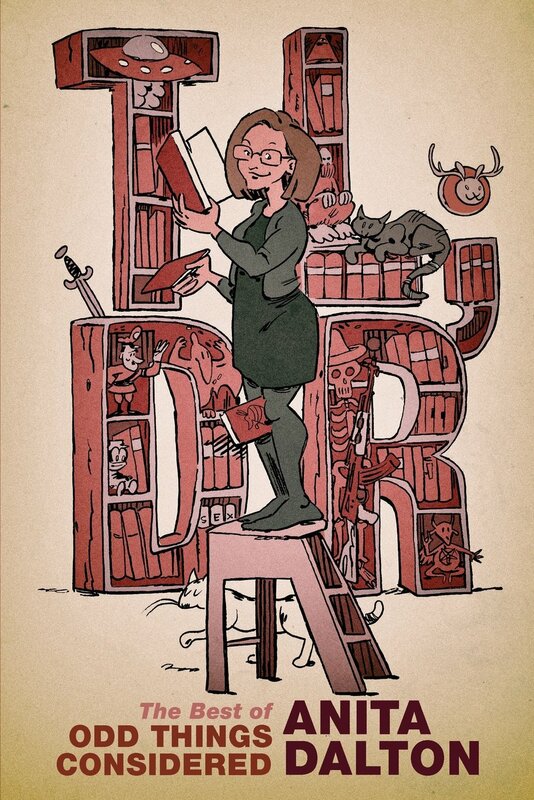 Conspiracy theorists like to believe that if a debunker does not refute every little point that they make then that means their theory has not been debunked. As a rule it is best to address every single point conspiracy theorists make so they cannot use their usual canards to dismiss good analysis. But sometimes a theory can be proven so false with attention to just one detail that there’s no reason to continue. The face analysis of the Naked Man is a detail that renders the rest of the arguments that the Naked Man is Tamerlan false. You will see the arguments that Tamerlan was the Naked Man mostly in “They Were Framed” theories. People who think Tamerlan is the Naked Man sincerely believe that Tamerlan was arrested safely then later killed to prevent him from potentially blowing the lid off the fact that the Forces That Be were using him and his brother as patsies in the Boston bombing case. These people use as absolute proof the fact that Maret Tsarnaeva, aunt of the accused Boston bombers, said she believes 100% that the Naked Man is indeed her nephew. On it’s face, this seems reasonable. Blood relatives recognize each other, right? This is a problematic area, but one thing to bear in mind about Maret Tsarnaeva is that by her own admission she had not seen her nephew in a long time. Maret said she had last seen her nephews five years ago. But she spoke to Tamerlan on the phone a year ago and was excited to hear news of his wife and toddler daughter. I’m sure Tamerlan’s aunt thinks she knows her blood kin well enough to know them when she sees them but if one has not set eyes on a family member in five years, especially someone who is not a part of a nuclear family who sees family members on a daily basis, a five-year lapse in contact certainly makes it hard to have much faith in Maret Tsarnaeva’s identification. The Naked Man is not Tamerlan. Tamerlan Tsarnaev is indeed dead and while there are a lot of questions about how it is he came to be so grievously injured, the fact remains that he is dead and the Naked Man is someone else the police, for whatever reason, took into custody that night. It would help if those in the investigations would reveal who the man was and why he had been stripped naked, arrested and then released but the bizarre choices of those in charge of the investigation have fueled more involved conspiracies than this about the Boston bombing. And not to beat a dead horse, if those in charge of this investigation would simply release some of the most basic information about this case, for many there would be no reason to cling to conspiracy theory and it would certainly go a long way toward discrediting the professional conspiracy theorists who fling conspiracy theories like a diner cook slings hash. But alas, Tamerlan is not the Naked Man and he was indeed killed hours before the Naked Man was taken into custody. The Naked Man, I wonder how he can lie so low with such internet fame to exploit! Maybe someone just saw this guy somewhere and thought he fit the description so cops pulled him over and stripped him to be sure there was no explosive on him! Yet another thing that could be laid to rest for all but the most intense stager/false flagger/Nick Vogt types. It would be nice if law enforcement would just say, “We caught this kid slacking, he looked like he might be Dzohkhar, we stripped him naked and found out later he was just some dude.” The refusal on the parts of so many government entities to clear things up is leaving so much fodder for speculation. I feel similarly about “Danny,” the alleged carjacking victim. The silence around him and ironclad protection of his identity is just weird. What would you have me do, M? Storm the FBI headquarters and demand they release the tape? Or better yet, spin an elaborate conspiracy theory around suspected to exist but as of yet unseen evidence? I’m sure you’ve got the latter covered but feel free to handle the first yourself, if you must, and be sure to let us all know what you find. Because until the trial begins and the tape is or isn’t shown, no one knows the disposition of the evidence and endless speculations about it being true or false are adding nothing to the sum total of truth or a search for justice. What is shameful is creating theory when you have no real answers. Don’t lose sight of that as you leave another dozen comments.